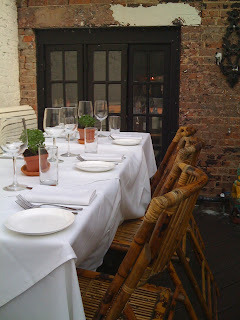 I've been fantasizing about this wonderful West Village, NYC restaurant I discovered last summer called Bobo. 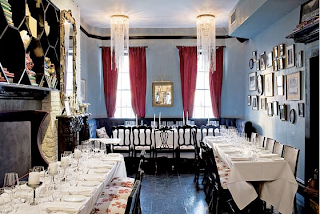 The name is short for 'Bourgeois Bohemian'-- a term that definitely describes the aesthetic of the space. There's lots of exposed brick, long curtains, antique chandeliers, books, candles and knickknacks tucked around the room. 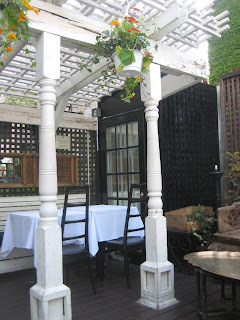 And the outdoor patio stole my heart. 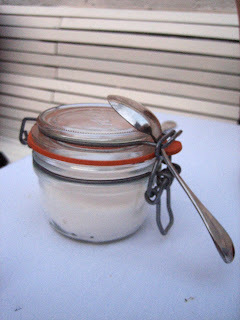 Dining outside on a warm balmy eve is one of my favorite ways to cap off a long day, NYC or anywhere. 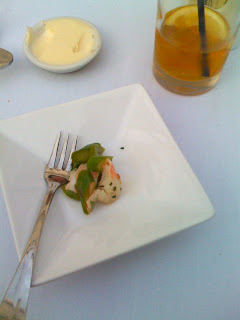 Sitting down to this bright, fresh asparagus and crab amuse, I knew I was in for a great meal. 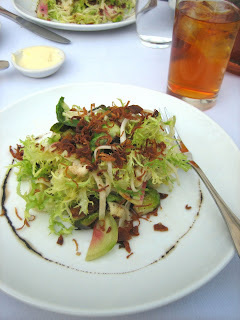 I still think about this salad of frisee, celeriac, watermelon radishes, avocado and crispy shallots drizzled with balsamic reduction. It was just the right balance of flavors and textures. 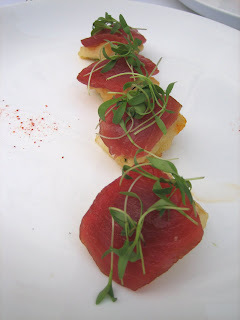 And this ahi was melt-in-your-mouth delicious. 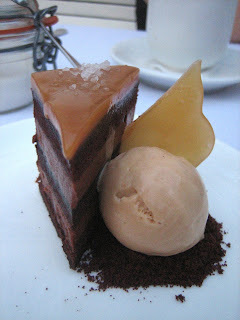 So many chocolate cakes fall short, but this one was spot on: chocolate cake layered with milk chocolate mousse, topped with salted caramel and a scoop of dulce de leche ice cream with a shard of toffee. Yum! Okay...well, that was fun to relive out loud. I think if I were in NY right now, I'd be hailing a cab. Next year! that chocolate dessert combines so many of my favorite flavors! yum!